The American Cemetery at Colleville-sur-Mer, just above Omaha Beach. Photos by John Fay. An Irish American takes a family trip to Normandy’s WWII battle site. This June marks the 70th anniversary of the D-Day landings when the United States and her allies, primarily Britain and Canada, launched the air and sea assault on Nazi-occupied France that marked the beginning of the long eastward march to Berlin and the end of the Second World War. Starting on June 6, 1944, thousands of Americans, along with their allied comrades, fought and died in Normandy in northern France. Understandably, D-Day and the battle for Normandy have been of great interest to Americans since the end of the war and the subject of umpteen movies and hundreds, possibly thousands, of books. Like many Americans I had read a couple of those books and like many more Americans I had seen a number of the movies and television programs, including The Longest Day, Saving Private Ryan and Band of Brothers. Again, like most Americans I’d long thought it would be great to visit Normandy, to take the family on a little WWII history tour, which I recently did. We took the short flight to Paris from Dublin, rented a car, checked the map and started driving. All well and good, but as we approached the Normandy coast I realized I didn’t really know what I wanted to see or what there was to see, other than the American Cemetery near Omaha Beach. Just as I was starting to take a little heat for my lack of planning for the trip, my 11-year-old son Eoghan spoke up. He has a healthy interest in history, something my wife and I have encouraged. It paid off on this trip. When Eoghan first heard where we were going he was excited. He watched documentaries on the war and did his own supervised online research. We knew what he was doing, but still my wife and I were stunned when he produced his prioritized list of things he wanted to see in Normandy. Stunned, but relieved, we now had a plan. 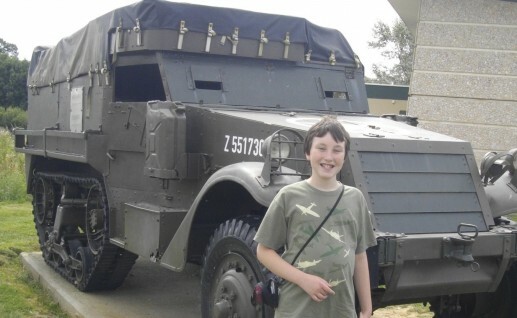 Eoghan standing in front of a Half Track troop transport vehicle. Still, I nearly drove by Pointe du Hoc. I knew I wanted to see where the Army Rangers came ashore and scaled the cliffs on D-Day, but I couldn’t remember the name of the place. Fortunately, Eoghan knew the name and shouted out when he saw the sign. Pointe du Hoc had highest priority on his list! Pointe du Hoc is a beautiful spot. The cliffs are magnificent, yet, all along the top of the cliffs there are massive gun emplacements – the guns that fired on the Allies as they sailed in towards the coast in June 1944. 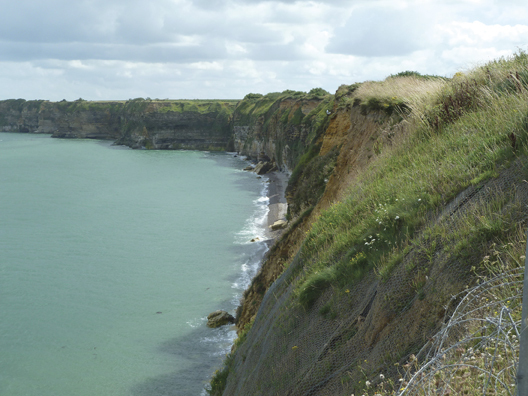 The cliffs as viewed from Pointe du Hoc provide some perspective on the task that the Rangers faced on June 6, 1944. As we approached the Rangers Monument, the number of bomb craters was striking. It wasn’t hard to imagine the mayhem that they had caused – the noise for those nearby and the death and destruction they rained down on the armada coming from England. The American Cemetery at Normandy is not far from Pointe du Hoc. It is in a beautiful location high up on the cliffs above Omaha Beach. There are nearly 10,000 Americans buried here and another 4,000 buried not too far away in Brittany, and when you add to that the 60 percent of those killed in the battle who were sent back to America for burial, it becomes obvious just how costly the battle for Normandy was. My first impression when I left the visitor center and walked out into the cemetery was the perfect uniformity of it – the white crosses perfectly spaced, perfectly aligned on a perfectly flat, perfectly green lawn. It may be a little too perfect; Arlington Cemetery is not as regimented. I almost had to force myself to walk among the graves as if my presence was disturbing the picture. The 150 or so Star of David grave markers help to break up the perfect uniformity. They are obvious from far off – the first signs that there are individual stories here. Then I saw the occasional Medal of Honor recipient. The lettering on their headstones is gold so they stand out. Once I was among the headstones my eyes seemed to find the Irish names – Kellys (and Kelleys), Maloneys, McCormicks, Murphys, O’Briens, O’Neills and many others. Yet, somehow, I wasn’t as interested in the Irish angle as I would normally be. I asked myself why. D-Day and the battle for Normandy was not about being Irish or Jewish or Italian or Hispanic or Polish, but rather it was all about being American. My Irish heritage was a non-issue here. My American heritage was what was most important. When I came across the Niland brothers, whose story was the inspiration for Saving Private Ryan, I didn’t care whether their background was Irish or German (German – I learned later) because it was irrelevant. They were Americans and that’s all that mattered. And that’s also true for the other 9,381 men and four women buried there. Still, as I walked among the graves I found the stark sameness of the grave markers a little unsatisfying. Every stone the same shape containing the barest details – name, rank, serial number, regiment and division. Nothing more, not even the age at the time of death is included. British war graves at Ranville. Each headstones in the center row features a harp, the symbol of the Royal Irish Rifles. The day before we had been in the British cemetery in Bayeux. Every headstone in the British cemetery is the same basic shape, but chiseled into each stone is the name, rank, service number, and the regiment. However, unlike the American stones the British ones have the regimental emblem and the age at death. There is usually a cross (sometimes a Star of David, sometimes nothing) on the stone, but even the crosses are not the same. Many of the stones include short sentiments, often a biblical passage, from the deceased’s family. It’s a style thing. I’m sure many people prefer the simplicity of the uniformity of the American cemetery, but I liked the individuality of the British stones. At the British cemetery I came across the grave of an Irishman. Of course, the Irish Free State, as it was then, was neutral during WWII, but this was a reminder that tens of thousands of Irishmen from north and south joined the British forces and an estimated 7,000 were killed in the war. They believed in the cause of freedom. Thanks to the Irish flag at his grave I spotted 28-year-old J. Mullally and we spent a few minutes at his grave. We finished our tour at Sainte-Mère-Église. I’ll admit that if it wasn’t for Hollywood I would never have gone there, but The Longest Day did such a great job of depicting what happened at Sainte-Mère-Église that I couldn’t help wanting to go there. Thankfully, it was high on Eoghan’s list too. If you have seen The Longest Day you’ll remember the scene. Red Buttons plays John Steele, who on D-Day parachuted into Sainte-Mère-Église, but his parachute got caught on the top of the church and he just hung there until the battle was over and he was taken prisoner. 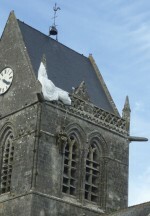 All of that actually happened, and the people of Sainte-Mère-Église commemorate Steele’s predicament with a dummy hanging on a parachute from the church roof (left). The local people are still proud of Steele, what the Americans did there, and even that The Longest Day was made there. It was a great trip. One I’d love to repeat because there is still so much more to see. Any American who ventures into Normandy can’t help but feel a great deal of pride in what those who fought there accomplished.